The development of VR casino sites has already started and very soon we are supposed to see the first of them pop online. Companies and software providers are already in the process of testing and gathering user feedback and perfecting what’s supposed to become mainstream. See inside what’s on the roadmap and what we can expect in the future, from VR casino sites. Depositing with credit or debit cards in a casino is a very easy process, but you have to make sure the casino is safe and secure. We have listed inside exactly what types of credit and debit cards most casinos accept and what things to look for when you are doing. Once you are convinced that you have found a safe and secure platform, only then proceed with depositing your money and playing. Blackjack is a popular casino game, that you probably know or have seen at least one movie about it. However there are different variants of the game, with different rules that many may not be familiar with. Come inside and see what are the top variants of blackjack and how they differ from each other. Ewallets are used a lot these days in order to protect your credit card, give you lower withdrawal & deposit fees and a lot of other benefits. We have picked the top 3 EWallets that casino players use every day and we have listed their benefits and how they can affect you. Read inside more on why Paypal, Skrill and Neteller are top choices of most casino players. While the term RTP may be known to some, other have no idea what that is. RTP stands for Return to Player and it’s the % of money you’d see return to you over a period of time. While it’s only a theoretical %, the higher it is the more consistent the casino game would be in keeping your bankroll. Every casino has a loyalty program of one sort another that rewards regular players and those who play a lot. Whether it’s called program, club, VIP or any other name, they all have one purpose and that’s to give you the player more bonuses. 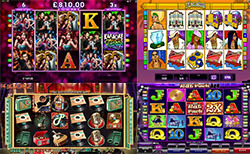 They range from faster withdrawal times, lower wager requirements, special bonuses and much much more.